New York City is known for museums, nightlife, shopping, historic sites, and parks. Your plan includes some of its best attractions: go for a walk through Central Park, take in panoramic vistas at Empire State Building, explore the world behind art at The Metropolitan Museum of Art, and make a trip to Statue of Liberty National Monument. For maps, more things to do, reviews, and other tourist information, you can read our New York City holiday planner. Nairobi, Kenya to New York City is an approximately 19-hour flight. You can also do a combination of flight and bus; or do a combination of flight and train. You'll gain 8 hours traveling from Nairobi to New York City due to the time zone difference. Prepare for somewhat warmer weather when traveling from Nairobi in June: high temperatures in New York City hover around 31°C and lows are around 21°C. Wrap up your sightseeing on the 8th (Sat) to allow time to travel to Washington DC. Washington DC is known for museums, historic sites, nightlife, zoos & aquariums, and parks. Your plan includes some of its best attractions: examine the collection at National Air and Space Museum, ponder the world of politics at United States Capitol, appreciate the history behind Vietnam Veterans Memorial, and contemplate the waterfront views at Tidal Basin. To find ratings, traveler tips, reviews, and more tourist information, read our Washington DC road trip planning website . Traveling by flight from New York City to Washington DC takes 3.5 hours. Alternatively, you can take a train; or drive. Traveling from New York City in June, you will find days in Washington DC are somewhat warmer (35°C), and nights are about the same (24°C). Finish your sightseeing early on the 11th (Tue) to allow enough time to travel to Cleveland. Kick off your visit on the 12th (Wed): tour the pleasant surroundings at Cleveland Metroparks, admire the masterpieces at The Cleveland Museum of Art, and then see the interesting displays at Rock & Roll Hall of Fame. To see reviews, where to stay, other places to visit, and other tourist information, go to the Cleveland online attractions planner . Traveling by flight from Washington DC to Cleveland takes 3.5 hours. Alternatively, you can do a combination of train and flight; or drive. In June, Cleveland is slightly colder than Washington DC - with highs of 29°C and lows of 20°C. Wrap up your sightseeing on the 12th (Wed) to allow time to drive to Toledo. Toledo is a city in and the county seat of Lucas County, Ohio, United States. Kick off your visit on the 13th (Thu): see the interesting displays at National Museum of the Great Lakes, then identify plant and animal life at Oak Openings Preserve Metropark, and then admire the masterpieces at Toledo Museum of Art. To find reviews, where to stay, and tourist information, refer to the Toledo trip site . You can drive from Cleveland to Toledo in 2 hours. Other options are to take a bus; or take a train. In June, daytime highs in Toledo are 32°C, while nighttime lows are 19°C. Finish your sightseeing early on the 13th (Thu) to allow enough time to travel to Chicago. Chicago is known for museums, historic sites, nightlife, zoos & aquariums, and childrens museums. Your plan includes some of its best attractions: explore the world behind art at The Art Institute of Chicago, admire the landmark architecture of Reliance Building, meet the residents at Lincoln Park Zoo, and examine the collection at The Field Museum. To find ratings, more things to do, photos, and tourist information, refer to the Chicago trip itinerary builder app . Traveling by flight from Toledo to Chicago takes 3.5 hours. Alternatively, you can take a train; or drive. You'll gain 1 hour traveling from Toledo to Chicago due to the time zone difference. In June, daytime highs in Chicago are 32°C, while nighttime lows are 20°C. Cap off your sightseeing on the 16th (Sun) early enough to travel to San Francisco. San Francisco is known for nature, museums, nightlife, shopping, and childrens museums. Your plan includes some of its best attractions: take in the views from Golden Gate Bridge, take in nature's colorful creations at Japanese Tea Garden, take in the local highlights with Walking tours, and don't miss a visit to Ferry Building Marketplace. For traveler tips, reviews, ratings, and tourist information, you can read our San Francisco trip website . Traveling by flight from Chicago to San Francisco takes 6.5 hours. Alternatively, you can do a combination of flight and train; or drive. Due to the time zone difference, you'll gain 2 hours traveling from Chicago to San Francisco. In June, San Francisco is slightly colder than Chicago - with highs of 25°C and lows of 15°C. Finish your sightseeing early on the 20th (Thu) so you can travel to Las Vegas. Change things up with a short trip to Hoover Dam in Boulder City (about 50 minutes away). The adventure continues: admire the local landmark of Bellagio Fountains, shop like a local with The Strip, try to win big at Paris Las Vegas, and enjoy breathtaking views from Eiffel Tower Viewing Deck. Use Inspirock's suggestions to plan your Las Vegas trip and find the best activities and attractions for your vacation. You can fly from San Francisco to Las Vegas in 4 hours. Alternatively, you can drive. In June, Las Vegas is much warmer than San Francisco - with highs of 46°C and lows of 29°C. Wrap up your sightseeing on the 23rd (Sun) to allow time to travel to Orlando. Pack the 24th (Mon) with family-friendly diversions at Universal's Islands of Adventure. 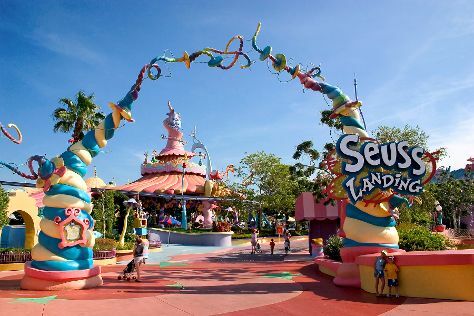 Pack the 26th (Wed) with family-friendly diversions at Universal Orlando Resort. Next up on the itinerary: get in on the family fun at Walt Disney World Resort. For maps, traveler tips, reviews, and tourist information, read Orlando day trip planner . Traveling by flight from Las Vegas to Orlando takes 9.5 hours. Alternatively, you can drive; or take a bus. Traveling from Las Vegas to Orlando, you'll lose 3 hours due to the time zone difference. While traveling from Las Vegas, expect little chillier days and about the same nights in Orlando, ranging from highs of 38°C to lows of 26°C. Wrap up your sightseeing on the 26th (Wed) to allow time to travel to Florida City. Florida City is a city in Miami-Dade County, Florida, United States and is the southernmost municipality in the South Florida metropolitan area. Kick off your visit on the 27th (Thu): explore the striking landscape of Everglades National Park. To see where to stay, maps, and more tourist information, use the Florida City tour planner. The Route module can help you plan travel from Orlando to Florida City. In June, plan for daily highs up to 36°C, and evening lows to 28°C. Finish your sightseeing early on the 27th (Thu) so you can travel to Miami. Miami is known for shopping, museums, zoos & aquariums, fun & games, and nightlife. Your plan includes some of its best attractions: admire the natural beauty at Fairchild Tropical Botanic Garden, examine the collection at Vizcaya Museum and Gardens, appreciate the extensive heritage of Art Deco Historic District, and browse the different shops at Village of Merrick Park. For other places to visit, more things to do, reviews, and other tourist information, read Miami trip itinerary builder tool . Traveling by car from Florida City to Miami takes an hour. In June in Miami, expect temperatures between 37°C during the day and 29°C at night. Finish up your sightseeing early on the 30th (Sun) so you can travel back home.